San Remo, a mainland township at the south-east of Western Port Bay, is 90 km south-east of central Melbourne. It is joined by a bridge to Phillip Island across an entrance to the bay known as The Narrows. 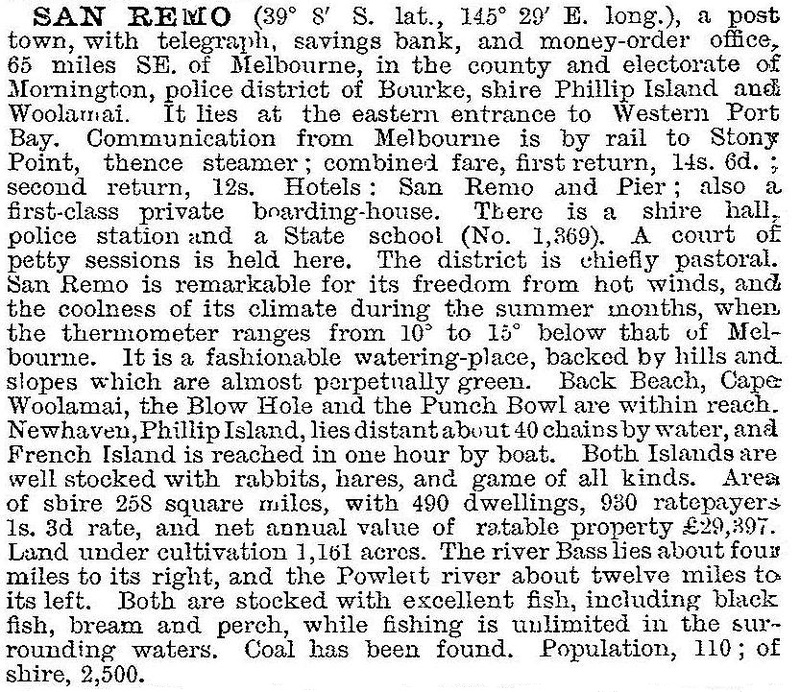 At the time of its first land survey in 1850 San Remo was known by its southerly land form on Bass Strait, Griffiths Point. The area was occupied for grazing and farming and a village developed in the 1870s. A school opened in 1874, and a jetty was built for transporting Kilcunda coal that was brought to Griffiths Point by train. There was one, possibly two hotels, the Pier and the San Remo. There were also stockyards (1875) for holding livestock brought from Phillip Island. They were swum across The Narrows when tidal flows were weakest. The Phillip Island and Woolamai Shire Council (1875) met at Griffiths Point from 1876 until 1913. In 1888 the council renamed Griffith Point at San Remo, a reference to the sea port in Northern Italy. Anglican and Catholic churches were constructed in 1906. In 1910 a railway was opened from Nyora to Wonthaggi, with a station at Anderson about 6 km from San Remo. In the next decade motor car travel made San Remo more accessible, and visitors had a choice of two boarding houses and the two hotels. There were also boats across Western Port Bay from Stony Point railway station. The Victorian municipal directory (1929) also recorded several fishers, a general store and a dance hall at San Remo. Punts were used across The Narrows until 1940 when a suspension bridge was opened. This was replaced by a larger concrete bridge in 1969. Commercial fishing became an important activity, with boats from San Remo and Newhaven, across the channel on Phillip Island, operating in Bass Strait. In 1949, a Fishing Co-operative was formed to market and distribute the catch more efficiently. Fresh fish is also sold from the Co-operative building at San Remo, and the pelicans which congregate each morning to gorge on fish scraps are a popular tourist attraction. The ceremony of blessing the fleet was performed each year on the first Sunday after Christmas. In 2010 the co-operative opened a 60 seat restaurant overlooking the pier. Many holiday houses have been built in recent years, the town's economy resting on a blend of fishing and tourism. There are still two hotels, as well as many businesses such as restaurants, cafes, surf shops and souvenir shops catering to tourists. There are two caravan parks, one adjoining the Back Beach area. The town's aspect has changed over recent years. When the second bridge was constructed, the foreshore was filled in. The massive cypresses, long a landmark in San Remo, were removed in the early 1990s because of old age and instability. As motorists leave the Bass Highway at the Anderson turnoff and go along the Island Tourist Road they pass through rolling pastures and elevated views over Western Port Bay. For several years there has been agitation from developers to move the San Remo town boundary eastwards to take advantage of lucrative cliff top land values. In 2009 a planning panel rebuffed such a proposal which had been supported by the Shire Council. In the meantime a compact San Remo has a recreation centre, a public hall, a Catholic church, three caravan parks, a hotel, a shopping centre, a jetty, a boat haven and foreshore reserves. San Remo was identified in 2011 as one of the localities in Victoria which future rising sea levels could inundate. San Remo primary school had 142 pupils in 2014. At the 2011 census, the median age of residents was 53 years. On census night 56% of dwellings were occupied, indicating that nearly half of them are holiday houses or units. A fossil found at San Remo in 2012 was confirmed as belonging to a 125 million year old ceratosaur, a dinosaur which had not been previously found in Australia.